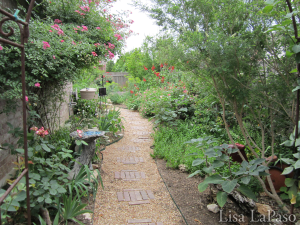 This space was recently recorded for an airing for Central Texas Gardener on PBS. We were really thrilled to have been featured and loved the idea of memorializing the space. An organic garden encourages all sorts of wildlife but can take years to cultivate spaces for food, water and shelter. 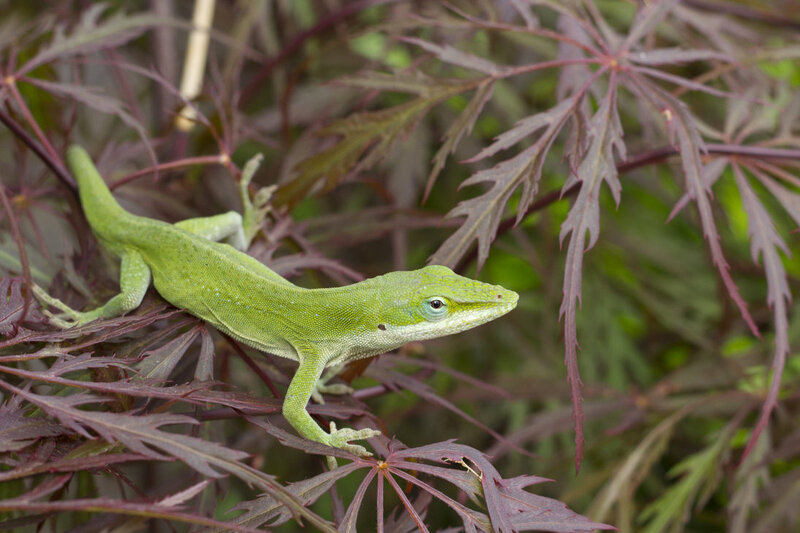 While I had no choice but to leave many of my beautiful plants behind I was really fortunate to have brought baby Anole lizards in the potted plants I did bring with me. I now have little baby lizards running all over my new space just waiting to enjoy their new digs. Now we are on a new builders lot with the standard two trees (that I immediately pulled up and donated to a good home) and inappropriately spaced shrubs (that I am tearing out along with the matching liriape, also to good homes) to make room for my big plans. 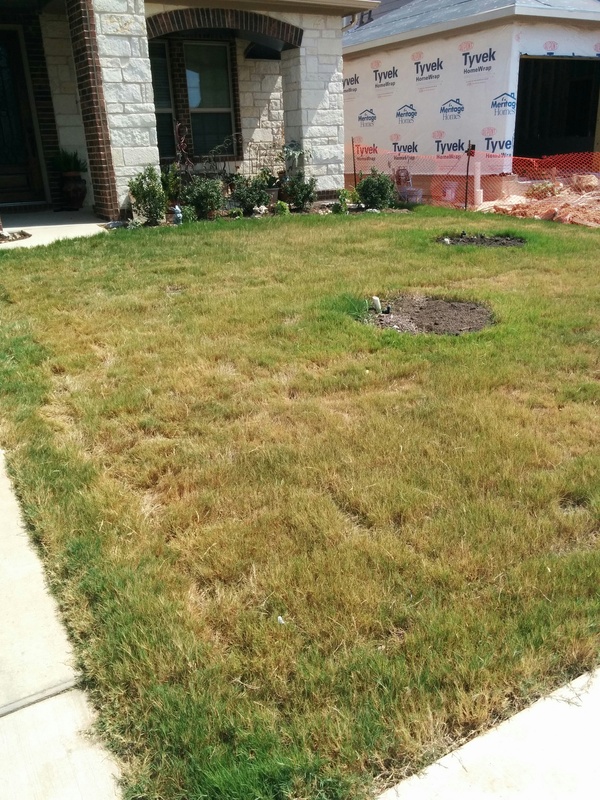 My front yard sans the two standard Oaks the builder puts in. 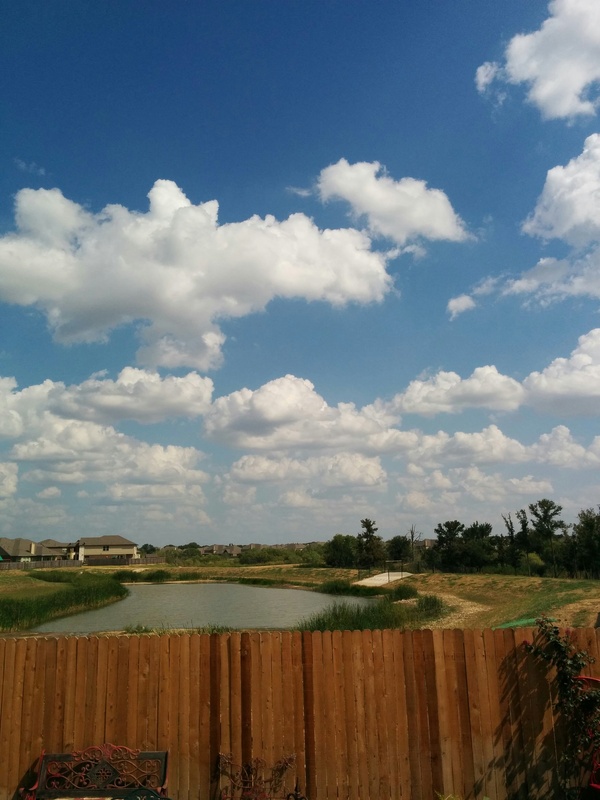 Note the distance they put two 30′ x 30′ trees from one another :/. 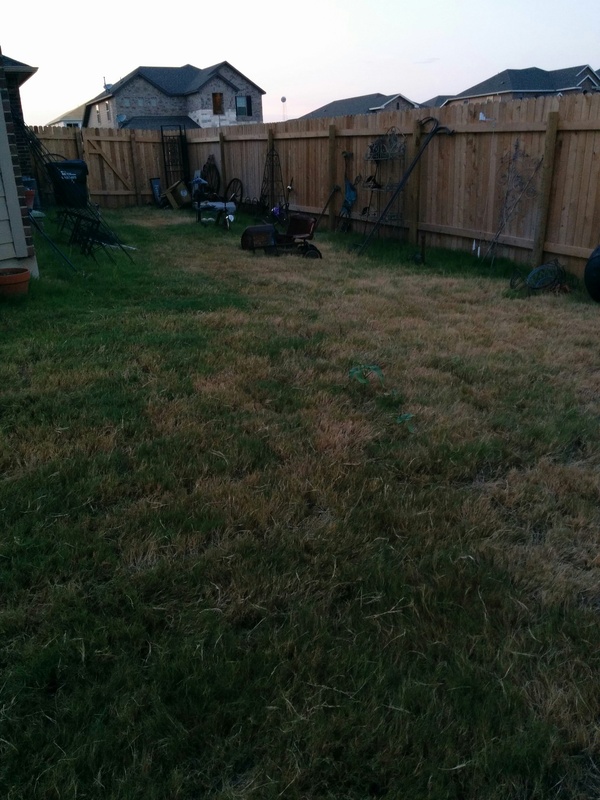 This is part of my new back yard…BORING! 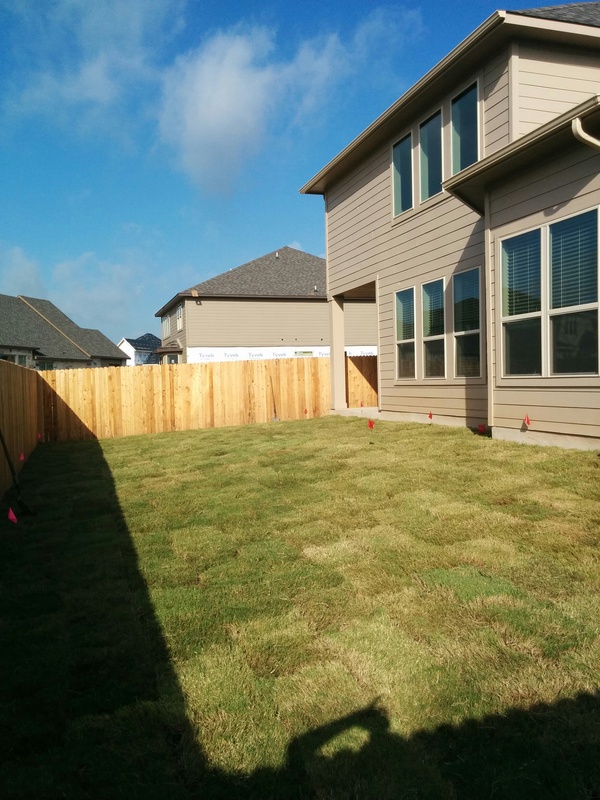 Rectangular, neighbors to hide and a whole lotta grass! 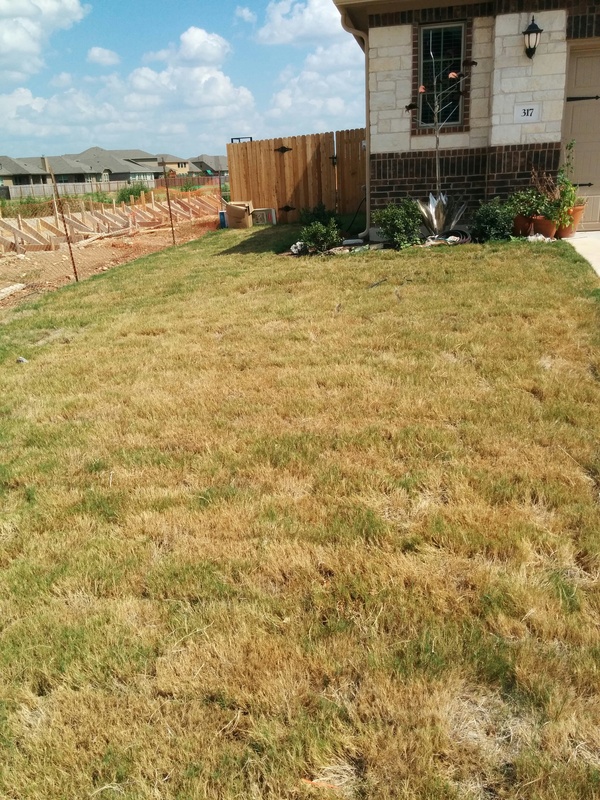 This is other side of my front yard not including the sidewalk with your standard grassy death strip. This is the left side facing my house. Lots of lawn, really dull builders plants and we will soon have a neighbor to hide from our view, or at the very least wnat to “enhance”. My little piece of heaven in an otherwise cookie cutter space. No one can ever build back here and the breeze is always blowing. My plan will enhance this space and be an important part of my design concept. Before I packed up my old home I walked through my garden and gave big hugs and props to all of my plants and trees and thanked them for their unwavering determination. I made mental notes of all the plants I must have again and said goodbye to those who will remain a memory. 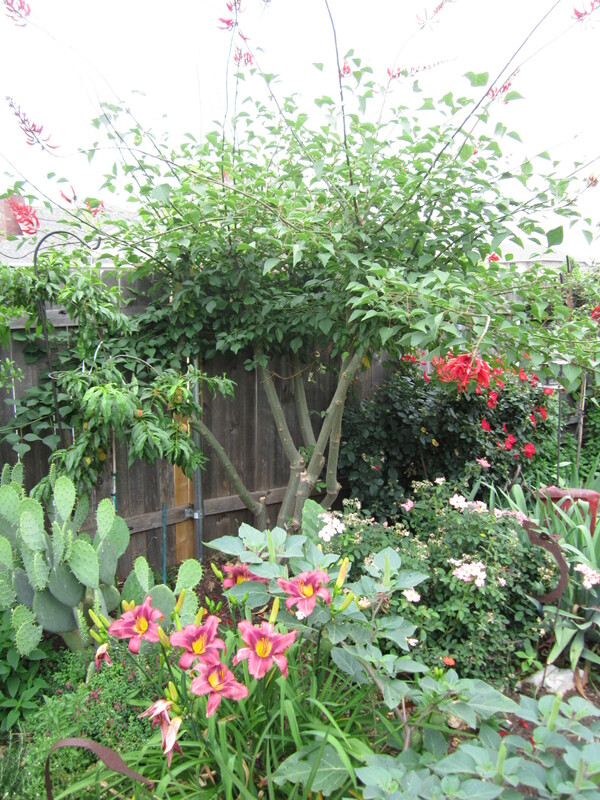 I also plan to introduce some new plant children to this space that I am excited about making new memories with. Now, if I didn’t do design and consults for a living, my very first step in our new home would be to hire “me” to do a consult to strategize on creative ways to hide the flaws and enhance the assets. Lucky for me, I am me (modest much?) so I just wanted to live here for a minute to see things from my new perspective then hit the ground running. I already know when I am done that you will not know I have neighbors, I will have lots of edible plants and trees, loads of color and textural interest, a large patio to enjoy the beautiful natural space and pond behind me with a small pond of my own that feeds into a disappearing river stream that appears to flow into the larger space outside of my yard. Enhance with some art in all the right places and in a few months the magic will happen. I will be sharing my new creation on this blog and on my YouTube channel so be sure to stay tuned at https://www.youtube.com/user/LisaLaPaso. You bet ya, I plan to remove copious amounts of lawn and plant for the wildlife. it is going to be fun! Congratulations on your move. A clean slate-isn’t that what we all want. Look forward to reading about your plans for design. You should have sold those trees back to the builder! May God Bless you and your family in your new home! I am sure you will perform magic with your new yard.